The Distillery @ Paperhaus, Washington DC - February 28, 2012. 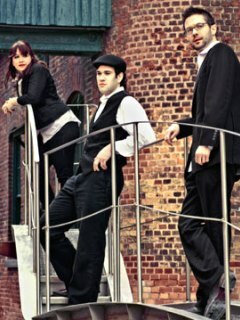 This is a trio from Toronto who are touring throughout the midwest and east coast and are just working their way home this week. They play blues music which often does not excite me, but it does not take long before I realize that this band is not just an ordinary blues band. There are female vocals, acoustic guitar, and the third member rotates between harmonica and piano. The first song showcases outstanding harmonica. This is not one of my favorite instruments, but he plays it with great control of the volume and an incredibly smooth transition between notes. Shrill this is not. The vocals are excellent and also show a great understanding of dynamics and do not go off into pseudo-Joplin territory. The guitarist is fitting in nicely until the third song when he moves to the front of the sound and shows that he is one of the best guitarists you will likely see in a while, as he has incredible speed and touch. The three of them continue on with a softer lounge jazz take on the blues. They combine great style and substance and know how to work off of each other. This was an excellent set that went over extremely well with the crowd. Yet another great band from Toronto, even if one of the members disagreed with my assertion that Toronto's bands are much better than the more heralded Montreal. He may be right, but as I see or hear bands one at a time, I still believe Toronto is as vibrant a scene as anywhere. Photo Credits: (1) The Distillery, (2) Jonny Grave (unknown).